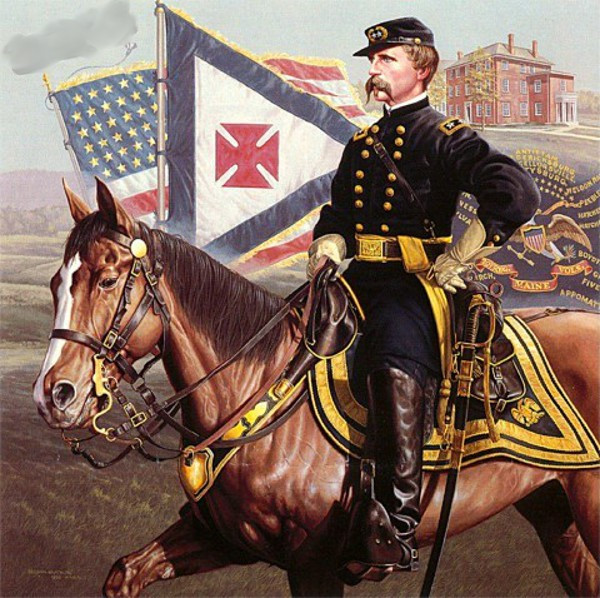 You did not want to be General Joshua Lawrence Chamberlain‘s horse… The job application really should’ve included something like “extreme hazardous conditions; great risk to life and limb.” As the story goes, six horses were shot while Chamberlain was riding them. A bad luck rider? Chamberlain’s horse toward the end of the American Civil War was Charlemagne. Really for all the things this amazing horse did, he ought to be in more paintings and sculptures. I didn’t find a particular story or primary source account about the horse’s name, but I’m pretty sure J.L. Chamberlain gave his brown horse the regal name. The general was a college professor before the war and had a great interest in past history and languages. Charlemagne (the horse’s name-sake) was a French king who became Holy Roman Emperor in 800 A.D. The king was known for his support of education during the Dark Ages and exploration of languages and history. Definitely a historical person Chamberlain would’ve admired. According to Chamberlain’s biographer Alice Rains Trulock, during the autumn of 1863 (after Gettysburg), a small Morgan horse with scars and sores from pack-service was captured from the Confederates. Chamberlain took a liking to the horse and bought him for $150 from the U.S. Government. With attention, grooming, and TLC, Charlemagne’s appearance improved drastically and he became an affectionate animal-friend. The horse appears frequently (though not usually mentioned by name) in Chamberlain’s writing and was the colonel/general’s main mount for the duration of the war. During the opening maneuvers around Petersburg (before Chamberlain was wounded), Charlemagne was badly injured in the hindquarters; the horse would eventually recover and was waiting when his owner returned to the field after making his own recovery. During the Appomattox Campaign, Charlemagne was Chamberlain’s horse – carrying the weary commander through battle, mud, and rain. In one conflict, horse and rider were both wounded by the same bullet, but remained on the battlefield together. They also took a tumble into the Buffalo River; the general waded out without much difficulty, but it took three men to rescue Charlemagne! During one leadership moment during the Appomattox Campaign, a Confederate soldier spotted Chamberlain and Charlemagne making an impulsive charge. The enemy in gray described the moment: “I thought it was one of the most gallant things I had ever seen.” A compliment to the general’s bravery (and undoubtedly his horse too!). 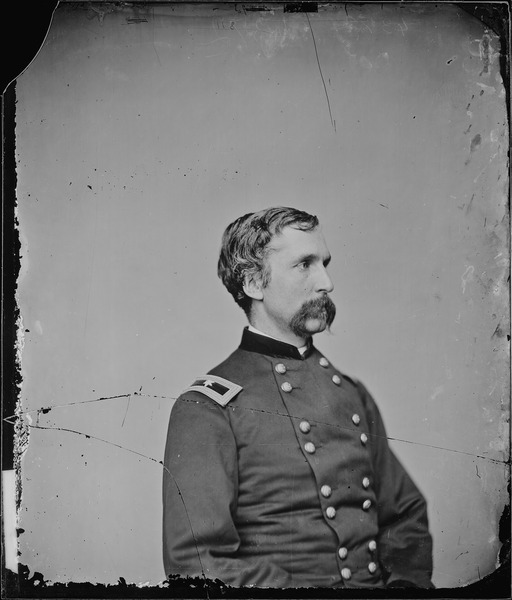 Joshua Lawrence Chamberlain was a writer, and he penned many articles and reminiscence after the war. (Note: much of his writing should be read with caution; Chamberlain had a way of telling his version of the story, and it doesn’t always accord well with other primary sources.) Charlemagne is mentioned in his officer’s writing. …my excited horse, [was] stirred by the vastness, the tumult, the splendor of the scene. He had been thrice shot down under me; he had seen the great surrender. But this unaccustomed vision, – he had never seen a woman coming so near before, – moved him strangely, Was this the soft death angel – did he think? calling us again, as in other days? For as often as she lifted the garland to the level of my hand, he sprang clear from earth…. From that time my horse was shy of girls, – sharp eyes out for soft eyes, – I dare say, for his master’s peace and safety! Charlemagne survived the Civil War. He was present when the first Confederate white flag was waved at Appomattox. He was the horse Chamberlain choose to ride at the formal surrender ceremony on April 12, 1865. And he paraded in the Grand Review of the Armies in June 1865. It seems that Charlemagne got to move when the Chamberlains established their seaside summer home – Domhegan. In the end, the beloved war steed and family pet was buried on the property. Most statues of General Chamberlain depict him without a horse, but Charlemagne has been featured in a few paintings and is “immortalized” in a tapestry that hangs in the Chamberlain house. The little rescued horse was with Chamberlain through some of the best and worst of times. Perhaps in more ways than we can fully understand Charlemagne saved Chamberlain – carrying him through enemy fire and being that friendly, understanding, wordless companion through the wearying campaigns. Both general and horse understood pain and wounds, but they soldiered on together – symbolizing the unbreakable bond between a good horse and caring rider. P.S. Anyone else think there should be a movie or at least a picture book about Chamberlain and Charlemagne? Love this post!!! I’ve been wanting to learn more about Chamberlain’s horse! I’ve written a few posts on my blog (www.cwfangirl.wordpress.com). I find them so interesting to research! You may be interested to learn that August 2, 1865 Charlemagne returned to Brunswick by train. The same day (maybe on the same train, but I don’t know how many trains arrived daily in Brunswick at that time) General U. S. Grant arrived with his family and staff. He was there to receive an honorary degree.